This weeks hunk stalks the halls of parliament like a murderous and clever Zack Morris, launching into audience asides that put us in his confidence even as he's manipulating, scheming, and killing to get what he wants in this BBC classic three part miniseries. You'll see the devilish charm I mentioned above in spades here. 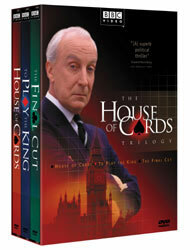 We're introduced to Francis Urquhart in House of Cards, where someone has made the mistake of passing him over for promotion. Many people will suffer for the oversight, but, of course, I don't want to give away too much. The second part, To Play The King, finds Urquhart butting heads with an idealistic new king. More scheming follows until the final installment, The Final Cut where we see his demise. The story is a clever and complex satire of greed, politics, ambition, and true intentions. Richardson makes us cheer for his evil, dark-hearted character and we love all his wicked deeds even as we're shocked by them. While this series was not overlooked by critics of its time, I feel like more of my peers should see it than have.